Broker data feed to display a variety of useful stats for tanking. Left click will toggle including block chance in the avoidance total, Right click will open the options. Started as a personal fork of FuBar_AbramsFu, the addon has been updated using Ace3 and LibDataBroker-1.1. 1.8 Suppose I should update here, too! - Display the target level in the tooltip. - Include Chinese translations (thanks zhTW). - Rename files and folders to satisfy my OCD tendencies. - Updated for a world without defense! - First public release. Don't remember why I started at 1.5, lol. Thanks, I added in checking for this. This accounts for the Night Elf racial Quickness, which adds 2% miss chance. Last edited by michaelawill : 01-15-11 at 04:49 PM. 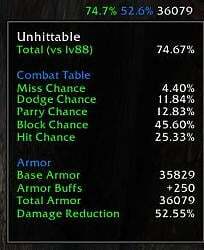 dus it work with druid tanks or is it mainly for warrior tanks?